It’s such a nice day out in New York, especially for what’s supposed to be 93 degree weather, so Gallery Mondays is headed to the outdoors this week. 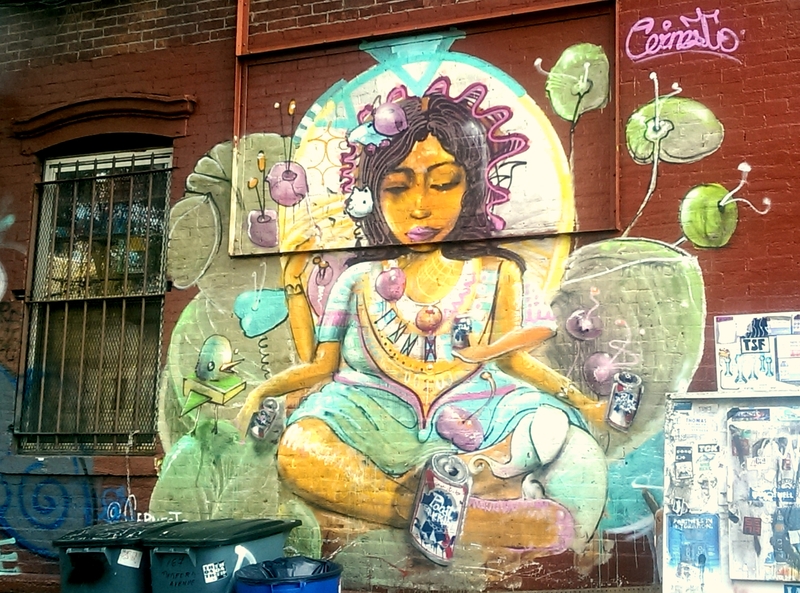 I found this lovely goddess on Beford and N 8th in Brooklyn about two months ago. She’s holding Pabst Blue Ribbon beers in three of her four arms, and I think she’s holding a fourth with her foot. I’m not sure if it’s accurate to call her a Pabst goddess because here she is again here sans the Pabst. The mural was done by Cernesto, who paints a lot of murals with this pinkish-purple aura. After looking him up online I kind of want to go find all of the murals he’s painted in the U.S. and abroad. See more of Cernesto’s murals here.